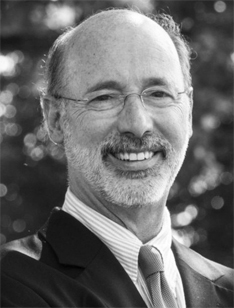 Tom Wolf is the 47th and current Democratic governor of Pennsylvania. Tom began his first term in office on January 20, 2015, and is running for reelection in 2018. The primary election is being held on May 15, 2018 and the general election will take place on November 6, 2018. As a businessman, Tom served as CEO and chairman of the Wolf Organization, a distributor of kitchen and bath cabinetry and supplier of building materials. Tom grew up in Mt. Wolf, and still lives in the house in which he was raised. Tom has been deeply and broadly involved with his community in York and beyond. He has served in leadership positions on a wide range of non-profit as well as business boards. Tom Wolf received his bachelor’s degree from Dartmouth College in 1972, his master’s degree from the University of London in 1978, and a Ph.D. in Political Science from the Massachusetts Institute of Technology in 1981. While at the University of London, Tom met Frances, marrying in 1975. Together for 42 years, Tom and Frances have raised two daughters, Sarah and Katie. Both daughters attended York County public schools before going to college. After graduating from M.I.T., Tom returned home and worked as a forklift operator and warehouse worker in the family business. Later Tom secured a loan with his two cousins to buy his family’s business – and as CEO, he turned it into America’s largest supplier of kitchen cabinets and a leading provider of specialty building products. He served as state revenue secretary under Gov. Ed Rendell from February 2007 through November 2008. In early 2009, Tom was preparing to announce his bid for governor when he received an urgent phone call that the company he sold three years earlier – a company he spent twenty-five years building and growing – was on the brink of going bankrupt and closing. Instead of walking away and leaving his former employees to join the ranks of the unemployed, Tom immediately ended his campaign and bought the business back, putting every penny he had into saving his family business. Tom changed the business model, transforming it from a distributor of other people’s products to a company that sources its own American-made cabinets. The business now returns 20 to 30 percent of its profits back to its workers. After Tom was elected as governor he declare that he wouldn’t accept a salary or a pension, banned his administration from accepting gifts, reformed legal contracting to end the pay-to-play culture in Harrisburg, and made his daily schedule available to the public. As governor, Tom restored the cuts to public education of the past administration that weakened Pennsylvania’ schools. He passed a fair funding formula to take politics out of school funding. Tom is dedicated to growing Pennsylvania’s economy and has worked closely with private industry on large projects like the Shell Cracker Plant in Western Pennsylvania, the Port of Philadelphia, a steel plant in Johnstown. He has worked to expand the Pennsylvania presence of companies like Amazon to make Pennsylvania a technology hub. Tom is committed to keeping the jobs of working Pennsylvanians in our state. He worked with Majestic Athletic, the official provider of on-field uniforms for all 30 Major League Baseball teams, to keep its plant in Easton open. Tom is also dedicated to ensuring that Pennsylvanians have access to quality and affordable health care. One of his first acts in office was to expand Medicaid which has given an additional 720,000 Pennsylvanians access to health care. Expanding Medicaid and increasing enrollment in CHIP by 20 percent have contributed to reducing Pennsylvania’s uninsured rate to well below the national average and to its lowest point in history. Tom is working with state and local public officials, non-profits, medical providers and families to make Pennsylvania a national leader in new and innovative ways to battle the opioid epidemic. To protect seniors, Tom has increased opportunities for older Pennsylvanians to remain in their homes, stood up to Donald Trump’s proposed “age tax” on insurance, and has saved more than 180,000 seniors from losing their Medicare Advantage health plans. He’s also worked across the aisle to move long-stalled legislation like medical marijuana legalization, liquor modernization, and pension reform. The Lansdowne Democratic Committee has endorsed Governor Wolf. Your vote will help Tom continue to use all of his leadership experience to fight for Pennsylvanians.